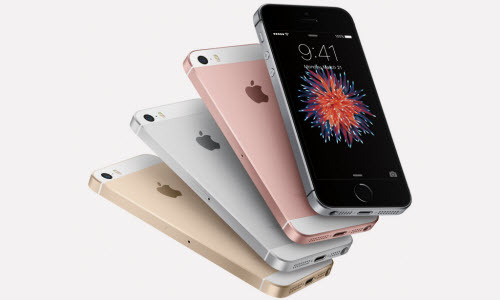 Apple’s newest phone, the iPhone SE, is here and it’s kinda but not entirely new. The cute little iPhone offers the components of the bigger iPhone 6S with a 4-inch screen and a form factor in line with the iPhone 5s. The round volume buttons and flatter edges also echo those of the 5s. If you think this is just a smaller, cheaper iPhone 6S, you’re mostly right. It has the same A9 processor and M9 motion coprocessor that enables things like always-on listening for “Hey Siri” commands and fitness tracking. The main camera matches that of the iPhone 6S lineup, with a 12-megapixel shooter that also captures 4K video. Live Photos save a bit of action before and after you capture a shot. However, there was no mention of 3D Touch. After years of using increasingly preposterously sized phones, it’s hard to imagine going back to a device the size of the iPhone SE. Of course, that’s not who the phone’s for—it’s for people who’ve never owned a phone before, or people who have so far clung resolutely to their smaller devices. For those people, the iPhone SE seems like a winner. Other than a couple of very small aesthetic changes, like the slightly less shiny sides and the SE logo on the back, this phone is a dead ringer for the iPhone 5S. Even with those changes, it’s still hard to tell them apart. The biggest difference is in using the phones: the SE is fast and responsive in a way the 5S isn’t. It easily keeps up with the newer phones, because internally, it is those newer phones. It’s odd that the SE doesn’t have 3D Touch, and odder still that all we got at the event was cagey answers about its absence. Otherwise, though, this is a thoroughly modern device. It’s the same thing, only smaller. That’s a hallmark Apple story. Many big phone users probably can’t stomach the tradeoffs of going back to a screen this small. And for most people, there’s probably nothing so compelling about it that many people will downsize, but at least now if you do it won’t be a downgrade. This entry was posted in Apple, iPhone, iPhone SE and tagged a9 processor, apple, iphone se, new iphone release, news by IosdroneD. Bookmark the permalink.